This is a fine (60 gram) solid 18k. 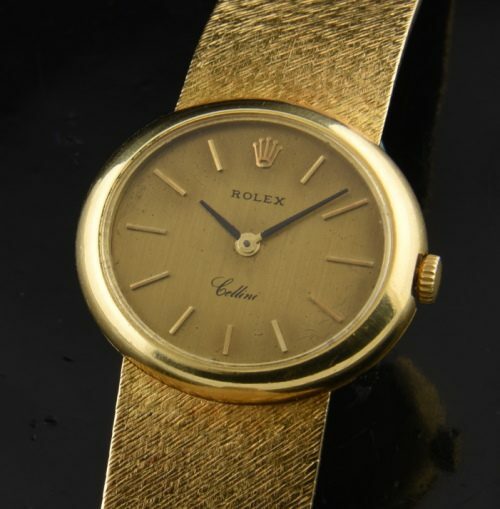 solid gold ROLEX LADIES CELLINI dating to 1968. The gold dial is original and in person looks great. This is not a tiny watch, but 26mm. across in the longest oval section. The serpentine 18k. solid gold ROLEX bracelet with signed flip style buckle is not kinked-well preserved. The fine manual winding ROLEX movement was just cleaned and accurate. This will fit up to a 6.25 inch wrist. There is a substantial amount of gold here. They don’t make’em like they used to! This vintage 60’s ROLEX watch is priced extremely well. You will love it!